Here at Bolt Burdon Kemp, we always try to keep abreast of the up-and-coming therapies that are available to people with a spinal cord injury (SCI). We do this because it’s a really interesting and dynamic area of medicine, but also so that we can try to secure the best therapies for our clients with an SCI. No, we don’t mean to keep ourselves looking young. Instead, we are talking about the therapeutic uses for botulinum. Spastic paralysis is a common side effect of SCI, causing pain and further immobility. Botox, just as it can relax the face, can be used to relax the muscles that spasm. This then prevents the spasm, providing relief for several months until a repeat injection is required. SCI can also cause the bladder muscles to spasm, resulting in an overactive bladder. Botox injections can be used to stop this, reducing the urgency and frequency of urination. It’s a relatively straightforward treatment that can be provided under local anaesthetic, or if you are at risk of Autonomic Dysreflexia, you may be offered a general anaesthetic. Understandably, most people who have an SCI say that bladder and bowel function is of greater importance than the inability to walk. Whilst Botox cannot reverse bladder dysfunction, it can make a significant difference to your day-to-day life and enable you to undertake more activities without being troubled by your bladder. FES is where electrical currents are used to stimulate the muscles. Through such therapy, muscle mobility can be improved. FES equipment comes in all shapes and sizes. 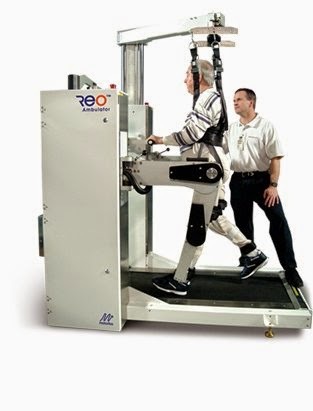 There are large FES exercise machines, including cycles for the legs and arms and even an FES walking machine. At the other end of the spectrum, there are FES machines for the hands, assisting people with their grip strength and dexterity. People with tetraplegia find the benefits of FES greatly enhance their life, enabling them to have better dexterity and grip, which helps with the most basic of tasks such as holding a pen or gripping a cup. FES can be used to increase strength, build muscle mass and improve circulation. It can be used to provide benefits beyond the muscles being stimulated. For example, FES focused on specific muscles in the abdomen can assist with bladder and bowel function, or even with breathing. FES machines can also be used to assist with whole-body health as they can be used for aerobic exercise, providing all of the cardiovascular benefits associated with regular exercise. By increasing circulation and muscle mass, it can also help to lower the risk of you developing a pressure ulcer. Locomotor training is a therapy for those with motor-incomplete SCI. It is all about retraining the brain and body to walk again. This amazing approach is based on the medical world’s current understanding of how the nervous system and brain control locomotion and how ‘neural plasticity’ (the ability to make new nerve connections and learn new things), works following SCI. First, a hoist is used to hold the person above a specialist treadmill. Then, several therapists (or robotic assistance) manually move the limbs through the motion of walking on the treadmill. The walking sends all sorts of signals back to the nervous system and brain. New nervous connections start to form and the body begins to adapt to the feelings and movements involved. Gradually, the therapists can reduce their input as the person can start to exert more control and do more of the walking themselves. If done successfully, this therapy can get people from a situation where they cannot stand or weight bear, up to a level where they can mobilise and walk around. For people who wish to walk again and miss the ability to stand, this a truly incredible feat of technology. A small implant with huge potential. 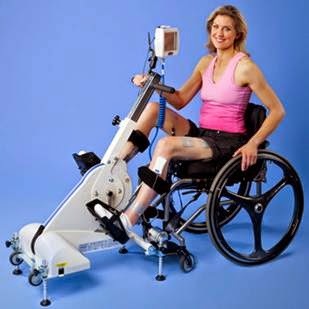 This is the next step up from FES – rather than using electricity to stimulate the paralysed muscles from outside the body, a device has been successfully implanted into the spine which then uses the nerves to transmit electrical signals, stimulating the muscles of the lower limbs. It is very early days into this research and neither its full potential, nor its effects are fully understood. However, of the four motor complete individuals who participated in the study, all four have been able to make voluntary movements and even achieved some fine control of their previously-paralysed muscles. It is an exciting area of research and one that we will keep a close eye on. 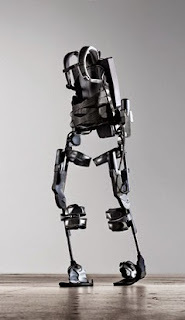 Straight out of science fiction comes the bionic exoskeleton. Companies such as Ekso Bionics and ReWalk are now manufacturing bionic suits that allow paraplegic individuals to weight bear, stand, walk, sit and climb stairs. Through the use of motors, batteries and rigid braces, the suit can drive the legs, allowing the user to do all sorts of things that were previously very difficult or even impossible. The manufacturers claim that it can be used across a huge range of people with SCI, up to and including C7 complete and that the battery will last a whole day. How can I get access to these therapies? Many of the therapies above are very expensive and require costly specialist input. For most, they are currently unaffordable. However, if you have recently sustained an SCI through medical negligence or personal injury that wasn’t your fault, the Spinal Injury team at Bolt Burdon Kemp have extensive experience in obtaining Interim Payments which can fund these vital and cutting-edge treatments, which we consider is vital in optimising our clients’ independence and quality of life. 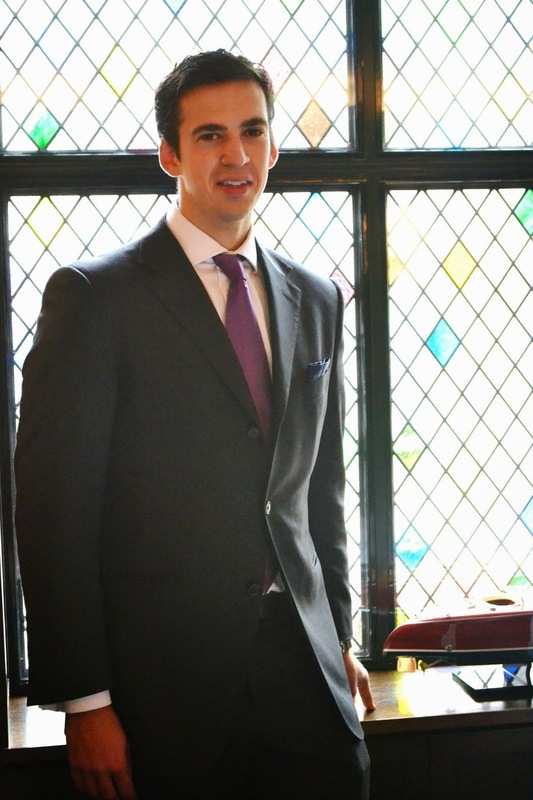 Bruno Gil works with Raquel Siganporia in the Spinal Injury team at Bolt Burdon Kemp.